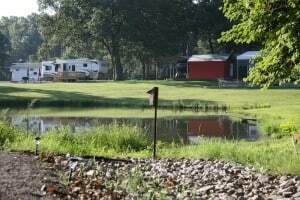 The big cabin is for our most adventurous guests looking for rooms near Rend Lake. The cabin is 24ft wide by 30ft long with a loft upstairs for sleeping. It has a functional kitchen with refrigerator, hot plate, coffee maker, and extra-large tabletop oven and microwave. It has plenty of dishes and pots and pans for cooking. The interior of the cabin looks just like it did when it was a barn in 1940, but we added a bathroom and separate shower closet so you won’t have to use an outhouse. There is also some really comfy furniture and a flat screen tv with satellite service. There are 2 queen beds in the upstairs loft and there is another queen murphy bed downstairs in the main living area. The big cabin is perfect for those who want a little adventure while on vacation. Don’t worry about the temp though, the big cabin has modern AC/Heat to make it comfortable all the time. Our drive through parking lot will accommodate vehicles of any size including trucks hauling trailers and boats. The cabin easily sleeps 6 with 3 queen beds. Number of overnight guests is strictly limited to 6, unless otherwise authorized. This is a first floor unit with approximately 20 stairs to sleeping loft. Please read this rental policy carefully. If you reserve a cabin, your reservation will serve as verification that you have read, understand and agree to be bound by the terms, conditions and obligations contained within.Coy and Wilmas, LLC is not responsible for the loss or damage to personal belongings or valuables of the Guest.